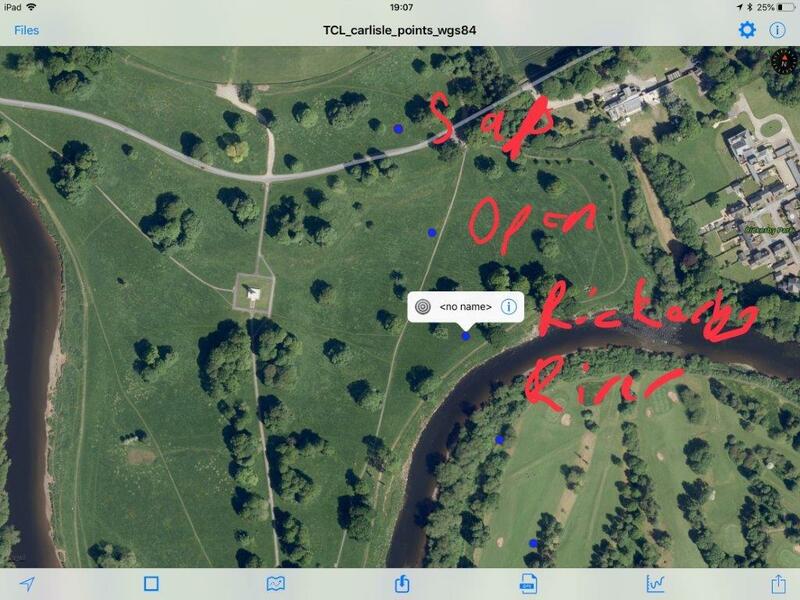 After projecting ourselves into the satellite image of Rickerby Park for at least two months, we arrive to find it’s a piece of common land owned by the people of Carlisle. It feels like an auspicious start to things. Cattle graze between April and November, and the ground underfoot is bumpy from their hooves. Dried ruts of mud. There are a lot of dog walkers and a bracing wind. The explanatory sign displays a quote saying how a walk in Rickerby Park is good for the constitution – in spite of… or maybe because of the wind. The river Eden winds its way through the flat valley bottom. Fast flowing and dangerous looking. John W. says ‘It’s more pastoral than I imagined’. We stand between the War Memorial and the river trying to locate The Common Line – or the set of GPS markers that Steven has produced that signify its trajectory. The points are 50 metres apart and run across the park and the surrounding streets, right to the edges of the city. I try to use the GPS machines we borrowed from the university to locate myself in relation to the line; but even though Steven gave us training, I find it difficult to navigate the menu. Am I in the right spot? Am I even using the right co-ordinates? I remember Steven’s explanation about GPS satellite data being precise but not necessarily accurate – an averaging out of readings and communications that create a continually updating but approximate location. It’s all very uncertain and perhaps I should be with an expert? John W., Volkhardt and Chris are using GPX viewer on their phones. The line displays on the software as a set of static blue dots, with you the ‘user’ as the mobile red dot, dancing towards your goal. Although it works on the same technology as the other machines, it feels much more authoritative – it’s much easier to navigate and more fun. It’s clear that we are one dot moving into alignment with another. It’s a game and the prize is conjunction. 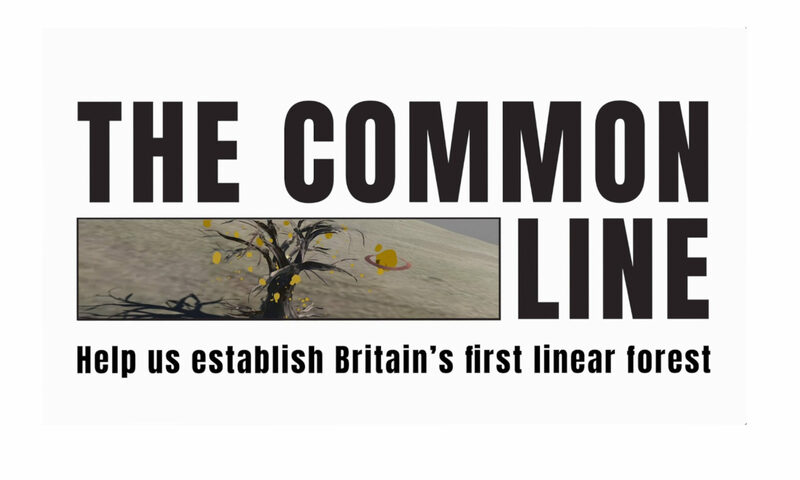 We find a number of dots on the line that don’t have living trees on them. We gravitate to them as special places on the line’s trajectory. A potentiality of place that could become even more special through having a tree planted there eventually. John W. spends a lot of time around a dot in the open grass of the park, between the already well established trees. John D. is at a dot by the river; listening to the flow of the water mixed with the voices of birds between the wind in the treescape. In fact all of these dots are no different to any other dot on the line – except through Steven’s arbitrary decision to mark them 50 metres apart – but they do lead the way to somewhere. Volkhardt walks in a straight line from dot to dot, over the fence, up the hill and into the distant streets where the big houses are. He returns half an hour later to tell us about the friendly man he met who lives near the line. He recommended we contact the Friends of Rickerby Park to see if they would help us. For the rest of the afternoon we walk from dot to dot. Along the river path, past the football ground – there are a couple of blue dots on the pitch but we can’t get to them – over the bridge, past the golf club and out into the streets of terraces beyond. We loiter by a dot outside someone’s house next to a privet hedge. It’s right on the main road which is planted with large plane trees in avenues, a bit like the ones they’ve been cutting down in Sheffield. The traffic moves by quickly. There is someone inside the front room of the house watching TV and we move to one side, not wanting to intrude. I think the line might pass right through their house. I imagine a virtual tree planted there. Next to the TV. But I guess that given the GPS accuracy as it stands, it might float around the living room a bit. This is the meeting point of three rivers running down from the surrounding hills. Along the roads south of the park there are purple ribbons on trees, and doors, painted on windows, marking the Carlisle flood line of 2015. The water went nearly to the top of the front doors. Huge amounts of river flowing from three different directions with nothing to hold it back. I imagine the floating furniture, peoples clothes, family photographs, children’s toys… the destruction of familar places and disruption of lives through the rapid and violent unmooring of things. In the common land of the park the council have already started a new planting scheme. There are water loving Willow and Alder that are protected from animal grazers by tree boxes, planted to hold the earth together, to slow down and absorb the flow.